In the autumn of 1830, five years after the opening of the Stockton & Darlington Railway, a scheme was projected for the construction of a line between Manchester and Sheffield. The enterprise bristled with engineering problems, for no railway having any pretensions to directness could avoid crossing the Pennine ridge, and of the different routes surveyed, that put forward under the name of George Stephenson was adopted. This proceeded by way of the valley of the Goyt, Bugsworth and Chinley, and so to Sheffield through Castleton and Hathersage. [*] The highest part of the main Pennine ridge was thus avoided, but nevertheless there would have been several gradients much too steep for the locomotives of those days, whilst a considerable amount of tunnelling was involved. The route selected was not without its critics, however, and a correspondent in the Sheffield Courant of 11th February, 1831, addressing himself to the shareholders and proprietors of the proposed railway, strongly attacked the gradients, the numerous bridges and the 6½ miles of tunnels in a route of little over 43 miles. It was asserted that a line via Holmesfield, Calver, Middleton Dale and Peak Forest, passing close upon Derbyshire coalfield and penetrating the best limestone districts in the country provided an easier and more profitable route "which it would be next to madness for the proprietors of the projected Railway not to avail themselves of". Taking into consideration the rugged nature of the country that lies between Manchester and Sheffield, the then state of engineering knowledge, and the opposition with which every railway project was assailed, there is no doubt that the scheme was an extremely courageous one. But it must also have secured overwhelming local support and possessed advocates of immense persuasive powers, for the Sheffield & Manchester Railway obtained its Act of Incorporation on 23rd August 1831, the capital being fixed at £530,000, with borrowing powers up to £176,000. A contemporary map shows that the route extended from Water Street in Manchester, where a connexion was to be effected with the Liverpool & Manchester Railway (opened in 1830), via Stockport, Marple, Whaley Bridge (terminal of the Cromford & High Peak Railway) and thence as already described to the canal in Sheffield. In the end, however, so difficult and costly were the works considered, especially the gradients and the tunnels, that it was decided to abandon the scheme,[*] no doubt to the satisfaction of the correspondent in the Sheffield Courant. Meantime, the nearby Liverpool & Manchester Railway, which was the first to use steam locomotives as the sole means of traction, had been taking receipts vastly in excess of the estimates of its promoters, and the outstanding success of this line, coupled with the development of other railways, were more than sufficient to keep alive the desire of Manchester and Sheffield people for a line connecting the two communities. And in 1835 a group of fifty-six influential men from Sheffield, Manchester, Ashton-under-Lyne, and Stalybridge, headed by Lord Wharncliffe, formed themselves into the Provisional Committee of the Sheffield, Ashton-under-Lyne & Manchester Railway, with a proposed capital of £800,000 in £100 shares, Charles Vignoles being Engineer. In the document then issued, inviting applications for shares, it was stated that under the superintendence of Vignoles a route had been obtained for a railway, practicable for locomotives, without the use of stationary power, and with only two miles of tunnelling at the summit where the Pennines were to be pierced. The actual route was then described. "It is intended that the station at Manchester shall be in or near Store Street, and from thence the Railway will proceed by Gorton, Ashton-under-Lyne (with a very short Branch to Stayley-Bridge), Hyde, Glossop, Woodhead, Thurleston, Penistone and Wortley to the Town of Sheffield . . . " It was also declared the new line "would be available to a population as numerous (with perhaps one or two exceptions) as is connected by any Railway in the Kingdom". Vignoles' suggestions were discussed at meetings held at the Cutlers' Hall, Sheffield, and the York Hotel, Manchester, early in January 1836, and in May of that year both he and Joseph Locke, Engineer of the Grand Junction Railway, were asked to make separate surveys. These were completed in October and referred back for joint revision in order that various differences of opinion between the two engineers could be reconciled. Their final proposals appeared in a Report of the Directing Committee dated 25th November 1836, in which it was shown that the proposed capital had been increased to £1,000,000 in £100 shares. There was a Directing Committee of twenty-six, headed by Lord Wharncliffe as Chairman and George Sidebottom as Deputy Chairman, drawn almost entirely from the original Provisional Committee of the S.A. & M.
Once again the projected route made use of the valleys of the Etherow and the Don, the principal differences between it and the one originally proposed by Vignoles being a longer Staleybridge branch, because of its divergence from the main line at Guide Bridge instead of at Ashton-under-Lyne, and the lengthening of the summit tunnel from two to three miles, whilst Glossop was to be by-passed about three-quarters of a mile to the north. The line was to start from Store Street in Manchester, and finish on a plot of vacant land to the east of the Cattle Market at Sheffield, a distance of 40¾ miles, the Stalybridge branch measuring 2½ to its termination on the side of the Huddersfield Canal. Most important of all, by lengthening the tunnel to three miles and reducing the summit level to 943 feet above sea level, no gradient on the main line was to be steeper than 1 in 120, the ruling gradient on the branch being 1 in 100 for slightly over a quarter of a mile. Vignoles stated that there would be no difficulty in obtaining locomotives "which will be able to travel with four or five passenger carriages, averaging 18 or 20 passengers each, between the two great Towns in about two hours and a half". He also considered that "gross loads of sixty tons in one merchandise train may pass between Sheffield and Manchester in about three hours and a half, or not exceeding four hours". In view of the existing prejudice against tunnels, heightened by the assertions of eminent doctors about the dangers to which passengers travelling through them were subjected, care was taken to state that the trains need only be in the tunnel for ten minutes. And, by way of further encouragement, "Lamps will, of course, be affixed to the carriages while passing through the Tunnel, as in the new Passenger Tunnel at Liverpool. Thus the time will scarcely be longer, and the accommodation quite as great, as at this (Liverpool) establishment, which is found to give the greatest public satisfaction, and is not attended with any inconvenience". Locke's report was in similar vein and it concluded with a remarkable accurate prophecy of the future development of the S.A. & M. upon which he was ultimately to succeed Vignoles as Engineer. He stated: " . . . looking upon your project as one of great mercantile importance, destined to form the direct thoroughfare between the East and West Seas, I have, in selecting the line, considered myself justified in encouraging some expenses which might otherwise have been avoided . . . the great, I may say greatest, unworked coalfield in England is contiguous to the line; and since this field must have an outlet to the Eastern Sea by the Humber, it amounts almost to a certainty that a communication between this Line and the Humber will at no distant period be made. This, in addition to giving to Manchester the important advantage of a Railway communication with the Grain District of Lincolnshire, will afford the readiest mode for carrying its yarns and manufactures for exportation to the Eastern Coast". The Bill for the S.A. & M., along with 117 other railway bills, was deposited in November 1836, the year which has been described as the one in which the foundations of the British railway system were laid. It met with comparatively little opposition, and that encountered from the Manchester & Birmingham Railway (then in process of formation by an amalgamation of the Manchester & Cheshire Junction and Manchester South Union interests) eventually resulted in an agreement whereby the S.A. & M. was granted the use of ¾-mile of the M. & B. line from Chancery Lane, Ardwick, into a proposed joint terminal at London Road, Manchester. And so, with the surprisingly low preliminary and Parliamentary expenses of less than £18,000, the Act of Incorporation was secured on 5th May, 1837. The first contract for the line, for excavation and other labour, having been let to Messrs. John Smith, Eckersley & Worswick, the Directors decided that the first ground should be broken with some ceremony. The place appropriately selected was near the centre of the railway, by the site of the western entrance of the Woodhead tunnel. Two marquees and a tent were put up for the accommodation and refreshment of the guests, and flags at intervals for miles along the valley marked the route of the railway. The day chosen for the ceremony, 1st October 1838, was, rather unexpectedly for those parts, fine and clear. And at 1.45 p.m. Lord Wharncliffe, accompanied by two of his sons, arrived by carriage from Wortley Hall, being received with cheers from the assembled guests. With Vignoles, the Chairman of the S.A. & M. descended the hill to the spot selected, and taking the spade, cut and drew out a sod and declared the ground duly broken. Then, in the words of a contemporary account in the Manchester Guardian, "Mr. Vignoles cut the next, followed by the Directors in turn. The ladies, whom the difficulty of descent prevented from forming part of the group, witnessed this ceremony from a neighbouring knoll, and appeared much amused with the awkward performance of some of the Directors and young men". Whatever discomfiture this may have caused, no doubt the excellent cold collation that was then partaken helped to mollify it. Two further events of interest that occurred in 1838 should be recorded. First was the decision, made in April, that the offices of the Company should be located in Manchester. And secondly, in November, remembering perhaps the abortive Sheffield & Manchester Railway of 1831, the S.A. & M. approached the Liverpool & Manchester with the suggestion that their line should be carried through Manchester to effect a physical connexion with the L. & M. The latter replied that they did not consider the time ripe for this to be done, and so the project fell through. Had it materialised, the history of the two railways concerned might have been considerably changed and Manchester itself would have benefited from greatly improved inter-station communication. In December of the following year Vignoles,, who had been appointed Engineer in April 1838 and Engineer-in-Chief in July 1839, resigned from the Company and was succeeded by Locke. It had been anticipated that the first stride of the S.A. & M., from Manchester to Godley, would be completed and ready for opening in September 1841, but delays had been caused in the preceding June and July by serious clashes between the English and Irish labourers engaged upon the works. Furthermore, the whole country was now being unsettled by Chartist troubles. Some of the shareholders began to complain of the slow progress being made, and they may have been encouraged to do so by the completion, on 1st March 1841, of the Summit tunnel near Littleborough on the neighbouring Manchester & Leeds Railway. Thus, by using this line to Normanton, the North Midland Railway from Normanton to Masborough, and thence by the Sheffield & Rotherham Railway, it now became possible to travel by rail from Manchester to Sheffield, albeit extremely circuitously. This route was referred to in the Sheffield & Rotherham Independent of 21st February 1844 when, under the ironical heading "Brisk Travelling", it was stated, "The passengers last Sunday evening by the quarter to five train from Sheffield reached their destination (Manchester) in eight hours. The train arrived at Normanton at the usual time, but had to stop there for an hour and fifty-five minutes. It then proceeded to Manchester, but so many were the stoppages that it did not reach that town until half past 12. Such are the inconveniences of this circuitous route". However, three days after Locke had presented his report, the first section of the line was ready for J. Parker, Esq., M.P. (who had become Chairman), together with the Directors, the Engineer-in-Chief and a numerous party of friends, to make an experimental trip as far as a temporary terminal at Godley, a distance of 8¼ miles. And Sir F. Smith, the Inspector of Railways, having certified the line fit for opening, it was brought into public use on 17th November 1841 without ceremony or display. As the joint station in London Road was not yet ready, use was made of the temporary Manchester & Birmingham terminal in Travis Street. The first public train to run on the line left Godley at 8 a.m. and in the reverse direction the first train to leave Manchester did so at 8.47 a.m. The latter consisted of but five carriages (one 1st class, two 2nd class and two 3rd class), drawn by an engine built by Kirtley & Co. of the Dallam Foundry at Warrington. Fairfield, the first station out of Manchester, was reached at 9.07, Newton & Hyde at 9.20 and the temporarily terminal at Godley, whence a coach or omnibus to Glossop ran in connexion with some of the trains, at 9.25 a.m. All of the stations were provided with wooden station houses of a temporary nature. Dukinfield (Dog Lane) was closed in the middle 'forties and Godley, which was located by the Hyde and Mottram road, disappeared when trains began to run further eastwards. The present Godley Junction station was not opened until 1st February 1866, when the Godley-Woodley line was brought into use. The railway was single throughout and the method of operation was to despatch a train from one of the terminals when a train from the opposite end of the line had arrived, an arrangement which aggravated delays when a breakdown occurred. Pending the construction of the London Road station, the S.A. & M. and M. & B. trains shared the same single line of rails between Travis Street and Ardwick junction. Of the latter place the Manchester Guardian of 20th November 1841 said: "Some caution will be requisite here to prevent two trains . . . coming into contact at this point. This, of course, may be done by arranging the times, or by keeping the rails separate, which indeed is to be the case when the line is completed to the new Manchester station, but at the present, the proper precaution seems to be to stand a watchman there to keep a look-out on both lines, and see that when a train is arriving on one line, there is no train arriving on the other, or if there be, to make the signal to one of them to slacken speed". No doubt some of the nine day policemen and three night policemen then employed by the S.A. & M. carried out this duty. It is recorded that their uniforms, and those of the four guards, were dark green faced with red; and the guards were given an additional touch of sartorial splendour by hats embellished with the title of the Company and the arms of Sheffield, Ashton-under-Lyne and Manchester painted on the front. Despite the incidence of an acute trade depression, the continuance of Chartist agitations, and shareholders unable to pay their calls, the S.A. & M. pushed slowly eastwards during the next three years, and new stations were brought into use at Ardwick and Gorton. On 10th December 1842 the line was opened to Broadbottom (later renamed Mottram & Broadbottom), and a fortnight afterwards, on Christmas Eve, Dinting (known as Glossop until the branch to that place was opened) was reached. From Dinting a coach took travellers forward to the Angel or Commercial Hotels in Sheffield, thus bringing that town within five hours of Manchester. 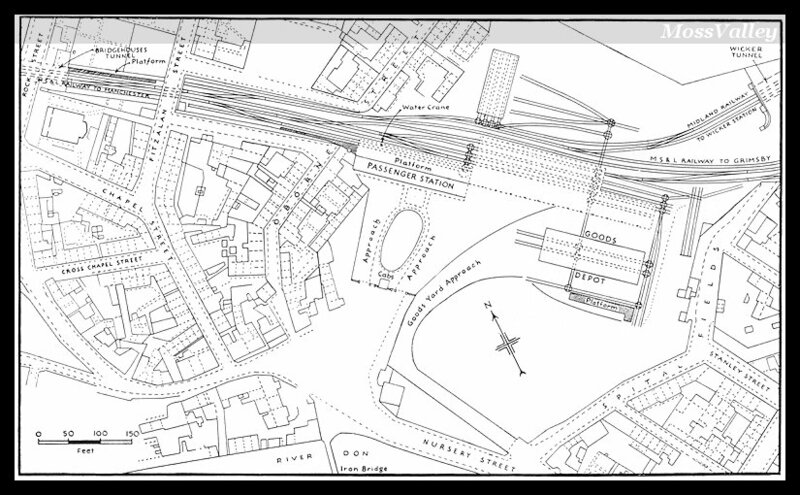 In the summer of 1843, the Directors of the Sheffield & Rotherham Railway approached the S.A. & M. with the suggestion that a junction between them should be effected in Sheffield, and the S. & R. Wicker terminal used by both companies. The proposal was undoubtedly prompted by the fear that a scheme then afoot to build a line from the future S.A. & M. terminal on Nursery Street in Sheffield to the North Midland Railway at Chesterfield would rob the S. & R. of the revenue they were then obtaining from the North Midland for the use of their line between Sheffield and Masborough. Apart from the physical drawbacks of such an arrangements, the S.A. & M. were supporting the Chesterfield line, and it was not surprising therefore that the S. & R. proposition was declined. As recorded later, a connexion with the S. & R. was completed nearly four years afterwards, when the Midland Railway had taken over the line. The next section, from Dinting to Hadfield and Woodhead, was opened on 8th August 1844. In this year the S.A. & M. revived its project for the branch to Ashton-under-Lyne and Stalybridge. Although a rival line, the Ashton, Stalybridge & Liverpool Junction, was in the field, the S.A. & M. secured the necessary Act and work on the 2¼ mile double track branch was commenced. It was also in 1844 that the S.A. & M. became jointly concerned with the Manchester & Birmingham in the promotion of the Manchester, South Junction & Altrincham Railway, primarily designed to give the S.A. & M. and M. & B. the much-needed connexion with the Liverpool & Manchester. The necessary authority for building this line, which was in two sections, namely one of 1¾ miles from London Road (M. & B.) to Ordsall Lane (L. & M.), and the other of 7¾ miles from Knott Mill to Altrincham, was obtained in the following year. Meantime, however, the M. & B. had come to the conclusion that a more intimate association with the S.A. & M. would be to their advantage, but feeling that by themselves they would be unable to make a sufficiently attractive bid, they approached the Midland Railway with the suggestion that they should together lease the S.A. & M. The Midland at once agreed to the proposal, for it not only offered a more direct route to Manchester, but freed them of dependence upon the Manchester & Leeds Railway for the movement of their Manchester traffic from Normanton. The terms offered by the Manchester & Birmingham and Midland Railways were accepted by the S.A. & M. Board, and a special meeting of the proprietors was called to confirm the arrangement. By now, however, the Manchester & Leeds had got to hear of the proposal, and on the eve of the meeting sent a counter offer on slightly better terms. Nevertheless, the meeting supported the S.A. & M. Board and a bill was duly deposited to legalise the lease of the line by the M. & B. and Midlands Railways. Six months later on 15th April 1845, however, the arrangement was repudiated by the shareholders, for by this time the M. & B. had become closely associated with the London & Birmingham Railway, a development not at all to their liking. And so another scheme that would have changed the course of railway history came to nought. On 9th June 1845, the one mile branch to Glossop, built at the expense of the Duke of Norfolk, was opened for traffic; this was worked by the S.A. & M. from the outset, and powers were obtained in the parliamentary session of the following year to take it over. Finally, on 14th July 1845, the line from Dunford Bridge to Sheffield, on the eastern side of the Pennines, was brought into use, thereby reducing that portion of the journey between Manchester and Sheffield to be performed by coach to the short run of slightly over three miles between Woodhead and Dunford Bridge. All that now remained was the completion of the Woodhead tunnel. And at long last, on 20th December 1845, General Pasley, the Government Inspector of Railways, accompanied by Mr. John Chapman, the Deputy Chairman, and other Directors, together with the Engineer-in-Chief and some of his staff, inspected the completed works, including the Stalybridge branch. "On going through the tunnel," stated a contemporary account in the Manchester Guardian, "the General was preceded in the train by a wagon bearing six men with torches, which were held to the roof and sides, the train proceeding very slowly so that the nature of the work might be closely and carefully examined, and we understand that General Pasley expressed his entire satisfaction with the work generally, and indeed declared that it was one of the finest pieces of engineering he had ever seen." The formal opening of the Woodhead tunnel and of the whole line between Manchester and Sheffield took place on Monday 22nd December 1845, more than seven years after the first ground had been broken. At 10.05 a.m. precisely, a special train of twenty carriages drawn by two engines, with flags flying and the Sheffield Yeomanry Band in full blast, left the Bridgehouses station in Sheffield. On the train were the S.A. & M. Chairman, Mr. J. Parker, M.P., several of the Directors, the Mayor of Sheffield, the Master Cutler and many Sheffield guests. Dunford Bridge was reached at 10.50 a.m. and, after a wait of twenty minutes to allow the locomotives to take water, the train proceeded through the Woodhead tunnel in ten minutes. On emerging at Woodhead, the passengers gave three hearty cheers, in which no doubt their enthusiasm was mingled with relief at having safely passed through what was then the longest tunnel in the country (3 miles 22 yards). Manchester was reached at 12.15 p.m., to the accompaniment of See the Conquering Hero Comes from the band, which appears to have been the signature tune for the opening of many early railways. At about 1 p.m. the guests from Manchester and district were received by Mr. Parker and the Directors and at 1.35 the special train set out upon its return journey to Sheffield. Stops were made at Newton, Mottram, Dinting, and other places to pick up more guests, and at the junction of the Glossop branch to allow the party to inspect the Dinting viaduct. The Woodhead tunnel was threaded in 13 minutes and Sheffield reached at 4.20 p.m., the guests then proceeding to the Cutlers' Hall where, it was recorded, "a very handsome and substantial collation awaited them." The dinner commenced at 5 p.m., and was attended by some 230 gentlemen. In the gallery was stationed the West Riding Yeomanry Cavalry band, and, it was said, "a number of ladies, who seemed to take a great interest in the proceedings." Then, in the words of the Manchester Guardian, "The cloth having been drawn about twelve minutes past six and Non Nobis Domini sung, the Chairman gave in succession 'The Queen', 'Prince Albert', 'The Queen Dowager and the Royal Family', and then the toast of the evening, 'Prosperity to Sheffield, Ashton & Manchester Railway'." Mr. Parker followed these with a review of the unparalleled difficulties with which the enterprise had had to contend, the struggle against events with impoverished finances, the distrust of the public, and the doubts of the shareholders. Nevertheless "the day, the long-expected, long hoped-for and auspicious day had at length arrived, he said, when the Board of Directors over which he had the honour to preside were enabled to offer to that great district and the important communities which surrounded it, a straight road, and he hoped, an excellently constructed road, from this great city of manufactures (Sheffield) to that greater home of manufactures and commerce which they had that day seen on the other side of the island." Various other speeches followed and then those who had to return to Manchester and district withdrew, to leave by special train at 9.30 p.m. Soon the S.A. & M. was to become an integral part of the Manchester, Sheffield & Lincolnshire Railway, which ultimately changed its name to Great Central and now forms an important component of the L.N.E.R. How this came about is briefly described in Chapter IV. Of the other railways mentioned in this survey, the Stockton & Darlington was absorbed by the North Eastern, which in turn became a constituent company of the L.N.E.R. ; the Grand Junction absorbed the Liverpool & Manchester and then united with the Manchester & Birmingham, and London & Birmingham, to form the London & North Western; the North Midland became a component of the Midland, which absorbed the Sheffield & Rotherham; the Manchester & Leeds changed its name to Lancashire & Yorkshire; and the London & North Western, Midland, and Lancashire & Yorkshire became three of the constituent companies of the L.M.S. Only the Manchester South Junction & Altrincham, now a modern electric line owned jointly by L.N.E.R. and L.M.S., retains its original name. The engineering piece de resistance of the S.A. & M. was the Woodhead tunnel which, with a length of 3 miles 22 yards, was the longest in the country when it was opened, and even to-day is the longest on the L.N.E.R. The original scheme was for a tunnel to accommodate two tracks, but, as already stated, it was decided to economise by constructing a single-line tunnel. At the outset it was necessary to make over four miles of cart roads across the moors for the conveyance of coal and materials from the public roads. The building of workmen's cottages, stables, magazines and the erection of the essential plant occupied many months, and it was not until September 1839, almost a year after the formality of cutting the first sod had been performed, by the site of the western portal, that a serious start was made on the tunnel itself. The Woodhead tunnel was built on an inclination of 1 in 201 rising in an easterly direction. For the greater part it was driven through huge millstone grit beds, with which occasionally alternated argillaceous shales and milder forms of sandstone, the remainder through slate formation and clay. Construction was accomplished by working from each end towards the centre, and by means of five vertical shafts, the first from the western end of the tunnel being 182 yards, the second and fourth 189 yards, the third 162 yards, and the fifth 135 yards deep, all having an effective diameter of about 8 feet. In each shaft a set of 9 inch pumps was provided, these being operated by a 20 h.p. steam engine. The sinking of the vertical shafts and the driving of the horizontal driftways were carried out by the S.A. & M. The centre line of this tunnel was transferred from the surface down the shafts by suspended wires, from which it was produced at tunnel level by theodolite. Combined with measurements of depth, the headings from the various shafts were then set out, to such a degree of accuracy that when the driftways from the shafts met each other there were never more than 3 inches deviation. When, in 1842, contractors were appointed to complete the work, Mr. Hattersley taking the western portion and Mr. Nicholson the eastern and greater part, the tunnel was driven throughout, but for about 1,000 yards. The form taken by the arch of the tunnel was that of a semi-ellipse, the rise being greater than the span, or something like the small end of an egg. The springing and soffit of the arch were respectively about 10 feet and 18 feet above rail level, the width of the tunnel being 15 feet at rail level. Two open side channels 18 inches wide and 24 inches deep were cut for drainage, and throughout the length of the tunnel 25 side arches, or manholes, were built 6 foot into one side at intervals of about 200 yards to facilitate the construction of a second tunnel should this be required later. During the period of actual construction, which lasted over six years, the number of men employed fluctuated considerably, and although at one time it was said to be as great as 1,500, the very nature of the work, entailing as it did so much in the way of excavation and removal of rock, prevented a large number of men being engaged simultaneously. No less than 157 tons of gunpowder were used for blasting and eight million tons of water were pumped out, whilst the total quantity of excavation was 272,685 cubic yards, about half of this being drawn up the shafts. The Woodhead tunnel was undoubtedly one of the engineering achievements of its time, and when it was completed, at a cost in the region of £200,000, it was not surprising that the Sheffield Iris waxed lyrical. "The tunnel itself is a wondrous triumph of art over nature," it said, "and may be pronounced the greatest engineering work of the kind which has yet been consummated. So accurately was it driven from the faces under the calculations of the Engineer, that the bores met within a few inches, and so direct is the line of perforation that when standing at the eastern entrance we had no difficulty in observing daylight at the other end, appearing like a small burning taper or a candle light in a dark cupboard . . . At each end is a castellated entrance which gives a graceful finish to the unrivalled work." Special precautions were taken to ensure against accidents. An S.A. & M. pilot engine was stationed at the tunnel and attached to the front of every train that passed through. On the front of the engine was fixed an argand lamp, with a large polished metal disc for reflection, so that a powerful beam of light was thrown forward on the track ahead. A contemporary newspaper account in the Manchester Guardian on 27th December 1845, also stated that "Cooke and Wheatstone's patent magnetic telegraph was being fixed in the tunnel with an index, etc., at the stations at each end, capable of being worked by the station clerks. The wires and other apparatus will be so fixed that if it be deemed desirable hereafter to extend this most rapid mode of communication to the termini of the line at Manchester and Sheffield, the tunnel telegraph can be attached to and form part of the whole." The single line through the Woodhead tunnel soon proved to be an acute bottleneck, and in 1847 work upon a second bore was begun. This new tunnel, which was to accommodate the up road, was driven alongside the original one, with which it was connected by the 25 manholes already mentioned. Its construction was marred by tragedy. In 1849 cholera stalked amongst the workmen at the Woodhead end, and within a short space of time had claimed 28 fatal victims. Three years afterwards, on 2nd February 1852, the second tunnel was opened for traffic. Communication through the Woodhead tunnels was improved in 1889 by the installation of electric bell signalling. [*] Each one of the 25 manholes was provided with two electric plungers, one for the up road and the other for the down, together with a single stroke bell answering for both lines. Thus by means of a comprehensive bell code a train crew could indicate their position and report their difficulty, such as failure of engine, derailment of vehicle, or broken rail, to the signal boxes at each end of the tunnel. To-day a modern telephone system has, of course, taken the place of this apparatus. Ventilation has always been a problem with the Woodhead tunnels, which have an odour all of their own, an odour one can almost taste as well as smell, which it was once said could be approached by drinking cheap port. The difficulty of providing adequate ventilation brought about the abandonment of a signal box in No. 12 manhole for operating intermediate signals installed on the up road for the purpose of increasing the capacity of that line. The precise date the box was brought into use is not known, but it was in existence in 1902 and closed about seven years later. Signalmen prepared to man the box on a reduced shift of six hours were not easy to find, whilst the smoke made the reading of the signals and observation of tail lamps extremely difficult; moreover, drivers of trains stopped by the signals found re-starting a troublesome job on the rising gradient. Better ventilation was effected by the Great Central Railway by doubling the diameter of vertical shaft No. 2, a lengthy task that was started in October 1912 and completed three years later. Besides the Woodhead tunnels there were two known as Hattersley Nos. 1 and 2 between Newton and Mottram, the Thurgoland tunnel between Wortley and Penistone, and a fourth just outside the Bridgehouses station at Sheffield, although all of them were less than ¼-mile in length. The Bridgehouses tunnel was opened out in 1909 and the two at Hattersley between 1928 and 1931. Of the numerous bridges and viaducts built by the S.A. & M., two were outstanding. The first was the Etherow viaduct at Mottram, a graceful structure of three laminated timber arches designed by Joseph Locke. The viaduct absorbed 186,000 cubic feet of stone, brought from the neighbouring Tintwistle quarries, and 41,000 cubic feet of timber. Measuring 506 feet in length and 136 feet in height from the foundations to the top, its cost was said to be in the region of £200,000. The other viaduct strode Dinting Vale with five main arches each of 130 feet span and eleven approach arches each of 50 feet span, its length being 1,455 feet and its height being but 15 feet less than that of the structure over the Etherow. After a life of some eighteen winters it was decided in october 1859 to strengthen both the Etherow and Dinting Vale viaducts by substituting sets of wrought iron box girders for the timber work and this was successfully accomplished within a very short time without mishap or delay to traffic. In 1894 the Etherow viaduct was again strengthened by additional girders, and 25 years later both structures were given further support by the erection of more piers. In the case of the Etherow viaduct, only three extra piers were needed, but no less than seven were added to the Dinting Vale viaduct, and they gave what was once a beautifully proportioned structure a most unsymmetrical appearance. The only stations of any size on the original S.A. & M. were the terminals at Manchester (London Road), which, as already explained, was the property of the Manchester and Birmingham, and at Sheffield (Bridgehouses). The former consisted simply of an arrival and a departure platform, the S.A. & M. offices being located at the Sheffield end of the latter. Known for many years as "Bank Top", the original London Road station eventually proved inadequate for the railways using it, and in 1859, after repeated disputes between them, it was agreed to build a new joint terminal. By the beginning of 1866 the work was nearing completion when, during glazing operations on 22nd January, one of the sections of the roof collapsed, injuring some 30 men, 17 of them seriously, 2 of whom unfortunately died. The rest of the roof was left in a dangerous state and the engineers concerned decided that it must be pulled down. And after the necessary fastenings had been gingerly removed, two locomotives, which had been connected by chains to pillars supporting the part of the roof that had remained intact, moved forward and the whole collapsed "with the most remarkable display of scintillation, the crushing ironwork giving out millions of glittering sparks." The traffic into and out of the station was suspended for two days and dealt with at Ardwick. When the new terminal was finally completed and partitioned between the two railways, the Manchester, Sheffield & Lincolnshire (successors to the S.A. & M.) had two platforms for its exclusive use. In 1881 the London & North Western (successors to the M. & B.) extended their portion of the station and the M.S. 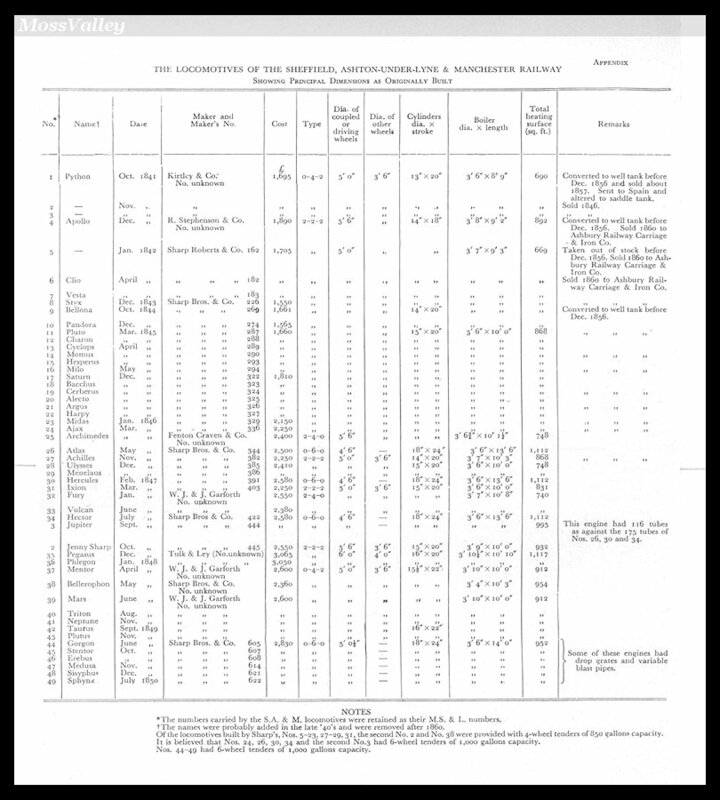 & L. thereupon brought another platform into use on 15th March 1882, making three in all, these being designated A, B and C to distinguish them from those of the L.N.W.R., which were numbered in the usual way, an arrangement that has persisted to this day. Electric light was installed in the portion belonging to the M.S. & L. soon after the name of the line was changed to Great Central in 1897, and, being almost the only place in Manchester to possess what was then a most novel form of illumination, the station became quite a show place. This must have made the L.N.W.R., which regarded itself as the "Premier Line", smart considerably, and as at that time there was no love lost between them and the Great Central, the latter rubbed salt in the wound by shading the lights so that they would not illuminate any part of their rival's property! Low pressure pneumatic signalling, which was installed between Ardwick and Newton when the lines were widened during 1904-6, was provided at London Road station in 1910; twenty-one years later it was converted to electro-pneumatic operation. At the Bridgehouses terminal in Sheffield there was but one platform, the plan showing the layout after the opening of the railway to Gainsborough and Grimsby and prior to the opening of the new station at Victoria, Bridgehouses thereafter becoming a goods depot. The ½-mile connecting line to the Wicker station of the Midland Railway will be observed on the right; this was opened on 1st January 1847, but so far as is known was only used for the exchange of a small amount of freight traffic. It is believed that the short platform located between Fitzalan and Rock Streets was brought into use at the same time or soon after the line was extended beyond Sheffield. It was probably used by through trains between Manchester and Gainsborough and Grimsby, thus avoiding the reversals entailed in entering the Bridgehouses terminal. Sheffield (Victoria) station was not opened until 1851, after the S.A. & M. had lost its identity in the M.S. & L., and is referred to at greater length in Chapter IV. Unfortunately neither the Sheffield, Ashton-under-Lyne & Manchester, nor its successor the Manchester, Sheffield & Lincolnshire, seemed to think that posterity might one day be interested to know what the earliest locomotives looked like. Certainly there is no known illustration in existence of any of the three engines built by Kirtley & Co. and set to work the first trains to and from the temporary terminal at Godley in 1841. It will be observed from the Appendix [click thumbnail], in which particulars of all the locomotives built for the S.A. & M. are given, that No. 1, eventually named "Python", migrated to Spain. Some three years later, in 1860, she returned to this country to work at the Brymbo Colliery until, as recorded in the admirable Chronicles of Boulton's Sidings, she was bought by Mr. I. W. Boulton who broke her up, keeping only the fire box plate as a memento of his association with the S.A. & M. This relic eventually came into the possession of Mr. H. Pollitt, one time Locomotive Superintendent of the former Great Central Railway and was illustrated in the Railway Magazine, Vol. IX, on pages 110-111, but it would be a genius indeed who could form from it any idea of the appearance of the "Python". Nor was the description of the three engines given in the Manchester Guardian of 20th November 1841 any more helpful. It merely said: "The engines have at present neither names, numbers nor other distinctive marks, and no bright brass work, so that they are certainly far more useful than ornamental." The S.A. & M. had no locomotive works of its own, but repair shops were established at Newton when the first section of line was opened. These were in the charge of Richard Peacock, who was the first and only Locomotive Superintendent of the S.A. & M., occupying a similar post on the M.S. & L. until 1854, when he resigned to help found the famous locomotive building firm of Beyer, Peacock & Co. Ltd.
No less than 36 of the 49 locomotives built for the S.A. & M. came from Sharp's, one of the ancestors of the well-known North British Locomotive Co. Ltd. The majority of them were singles of the 2-2-2 type which were to prove not altogether suitable for the heavy grades between Manchester and Sheffield; as a result, a number of them were converted to tank engines for working Manchester local trains. Two of the singles, Nos. 17 and 19, hauled the special train from Manchester on 22nd December 1845 when the line was formally opened throughout. A contemporary account in the Manchester Guardian noted that the engines were two of six just delivered by Sharp Bros. & Co. and stated "They are all provided with patent expansions so that they can either put on full or half steam." From which it is reasonable to assume that Nos. 17-23 were fitted with Sharp's version of the link motion known as "Cabry" motion instead of that of the older "gab" type. More useful than the singles must have been the seven 0-4-2 mixed traffic locomotives, built 1848-49. Six-coupled locomotives were, however, clearly required also on such a difficult line and 0-6-0's Nos. 26, 30, 34 and 3 (the second), delivered in 1846-47 to meet this need and known as the "Atlas" class, were the most powerful main line engines in the country when they first appeared. They were followed in 1849-50 by six more, with 5 foot 0½ inch instead of 4 foot 6 inch wheels, these being known as the "Sphynx" class, the one bearing that name being the last engine to be built for the S.A. & M. Both series were of the long boiler inside framed type, their cast iron wheels all being located in front of the firebox. And both series were rebuilt in the 'sixties, the "Atlas" class with 16-inch and the "Sphynx" class with 17-inch cylinders, and later still the cast iron wheels were replaced by wrought iron ones. These engines had a long life and some of them worked in the Grimsby district almost until the close of the 19th century. It has been recorded [Railway Magazine, Vol. XI, p. 109] that in 1844 Sharp's supplied the S.A. & M. with a locomotive constructed under Bodmer's patent and that in the following year four six-coupled goods engines built on the same principle were put to work. There is some doubt as to whether any such engines ever worked on the S.A. & M., for the Gorton archives, Sharp's old records and Bodmer's papers still in possession of the family make no mention of any such engines having been built for or owned by the railway. Furthermore, the Bodmer papers do not reveal any six-coupled goods engines having been constructed on this principle. It is, however, possible that the 1844 locomotive was a Bodmer, and if this was indeed the case, it would probably have been No. 9, for an official note states that during November 1844, the month after her appearance, her coke consumption was 21.92 lbs. per mile. This special reference would seem to indicate that her design embodied some new feature. When the first section of the S.A. & M. was opened in 1841, the total stock of carriages was fourteen, comprised of three 1st class, five 2nd class, and six 3rd class vehicles. The 1st class carriages and some of the 2nds and 3rds were built by Dunn & Son, coachbuilders of Lancaster; the remaining 2nds came from Allcard & Co. of Warrington and the other 3rds from Bradley of Sheffield. They were all favourably commented upon at the time of their appearance, the 1st class carriages being described as very similar to those of the Grand Junction Railway and accommodating six persons in each compartment, from the roof of which a lamp was suspended and "the aperture when the lamp is removed affords ventilation to the carriage". The 2nd class vehicles were likened to those of the Liverpool & Manchester Railway, except that the divisions between the three compartments were carried up to the roof. The 3rds, or "stand-ups", were simply described as "large and capable of holding a considerable number of persons". Fortunately for the travellers in the "stand-ups", improved 3rd class vehicles were introduced before the Woodhead tunnel was completed. In a timetable of the train services operated as from 3rd November 1844 it was specially indicated that to two trains, the 9.45 a.m. from Manchester and the 11.25 a.m. from Woodhead, "covered third class carriages, with seats, are attached". And when the Dunford Bridge-Sheffield section was opened for traffic on 14th July 1845, the Sheffield Iris exclaimed "The opening of this important line . . . took place on Monday morning, when large crowds had congregated in the vicinity of the Sheffield terminus to witness the first starting of some of the most splendid carriages that ever adorned a line of railway. To say nothing of the First and Second Class carriages, those of the Third Class are unparalleled for comfort and protection, being covered at the top and sides, and richly painted on the exterior. The guard box behind is sheltered on three sides and the top, so that even in the coldest season this important functionary will be protected from the inclemency of the weather." The carriages of the S.A. & M. were adorned with the names and arms of Sheffield, Ashton-under-Lyne and Manchester painted on their bodies, but the illustrations upon which the sketches of 1st and 3rd class vehicles were based gave no indication of this embellishment. The 3rd class carriage was said to measure 14 feet long, 6 feet 6 inches wide and 5 feet 3 inches high, and to accommodate thirty passengers. Soon after the opening of the first section of the line, a passing loop was installed at Ashton & Hooley Hill, thus allowing an end to be put to the initial arrangement of despatching a train from one terminal when one had arrived from the other end of the line; and in the summer of 1842 the line was doubled as far as Newton. When train services to and from Glossop (later Dinting) were commenced on Christmas Eve 1842, there were six trains from Manchester to Glossop, and four to Newton & Hyde, on weekdays, all but one departing at an even hour; on Sundays there were four to Glossop. In the reverse direction there were seven from Glossop and three from Newton & Hyde to Manchester on weekdays, these departing at an even hour or at 45 minutes past the hour; and on Sundays there were four trains from Glossop. All trains stopped at all stations, the journey from Glossop to Manchester being performed in 40 minutes, that in the opposite way taking five minutes longer. 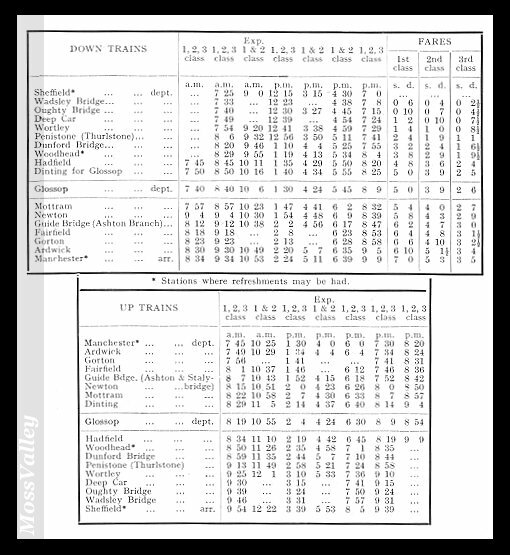 A timetable card issued by the S.A. & M. on 1st May 1843 showed several improvements in the train service. All trains now ran between Manchester and Glossop, there being eleven each way on weekdays, two down and two up trains calling only at Ardwick and Ashton, thereby reducing the respective journey times to 25 and 30 minutes. The Sunday service had been increased to five trains each way, one of the up trains starting from Ardwick. Later in the year, on 1st November, further alterations were made, and a replica of the handbill then issued is illustrated on the opposite page. The original measured 5 inches wide by 10 inches deep and was printed on white paper. Another timetable card for the services in operation as from 1st November 1844, after the line had reached Woodhead, showed a weekdays service of four trains from Manchester to Woodhead, a journey occupying 70 minutes, seven from Manchester to Glossop, two from Newton to Glossop, and one from Newton to Woodhead. Precisely similar arrangements applied in the reverse direction, the throughout journey taking 61 minutes. The Sunday service consisted of four trains from Manchester to Woodhead, two to Glossop, and one to Newton, whilst to Manchester there were run four from Woodhead, one from Glossop and two from Newton. 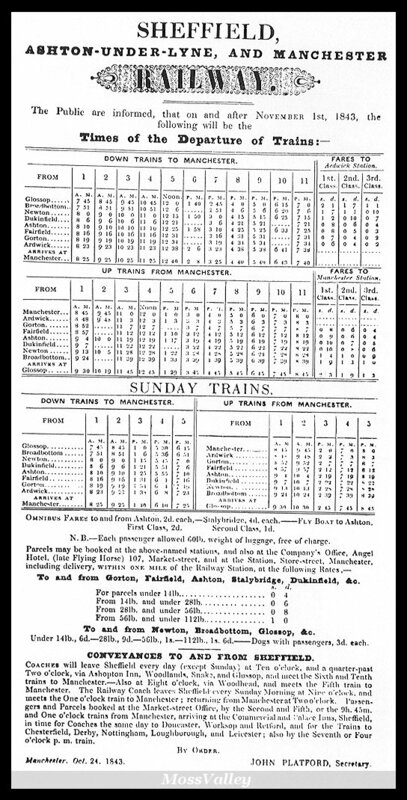 Finally, an example of the train service in operation after the line had been completed throughout between Manchester and Sheffield is given, this being extracted from Bradshaws Railway Companion for 1848. The year 1845 was in many ways the most fateful in the history of the S.A. & M. A marked tendency towards consolidation had already begun to manifest itself in the British railway system, then chiefly made up of small lines, and after the failure to lease their undertaking to the Midland, and Manchester & Birmingham, the S.A. & M. came to the decision that their best interests would be served by expansion through amalgamation. The Directors lost no time in implementing this policy. In a report to the shareholders dated 24th September 1845 it was revealed that the Barnsley Junction Railway had been absorbed. Far more significant, however, was the statement that negotiations for a treaty of amalgamation with two lines proposed east of Sheffield, the Sheffield & Lincolnshire and Great Grimsby & Sheffield Junction Railways, had been successfully concluded, thus giving birth to a west-east trunk line of considerable importance. Subsequent additions to this obviously desirable "end-on" consolidation were the Great Grimsby Dock Company and the Sheffield & Lincolnshire Extension Railway, and as from 11th January 1847 the combined undertakings adopted the title "Manchester, Sheffield & Lincolnshire Railway". In the same year the Manchester & Lincoln Union was absorbed and by a Consolidation Act passed on 1st August 1849 all the component companies were dissolved and re-incorporated as the Manchester, Sheffield & Lincolnshire Railway. So far as the original Manchester-Sheffield line was concerned, the next development of importance was the commencement in May 1847 of the viaduct known as the "Wicker Arches", immediately east of the Bridgehouses terminal, to carry the newly formed M. S. & L. to the North Sea; at the same time the foundations were laid for a new Sheffield station contiguous to the viaduct. In the same year the 1¾-miles Thurgoland mineral branch was completed and opened for traffic on 22nd November. Built by Messrs. Miller, Blackie & Shortridge, the viaduct at Sheffield measured 660 yards in length and crossed the Wicker with a magnificent arch of 72 feet span. Half its cost of about £80,000 was absorbed by piers and other preparatory work for the new station. During the period of construction there were two mishaps, the first on 8th February 1848, when a movable crane and some scaffolding collapsed, killing four men, and the other on 4th October of the same year, when an arch fell in. Despite these unfortunate occurrences, however, the work was completed within a trifle over 19 months, and on 16th December 1848 the first train passed over the viaduct. During 1848-49 several important additions at both ends of the railway between Manchester and Sheffield were brought into use. The lines from New Holland to Grimsby, Ulceby to Market Rasen and to Brigg, and Market Rasen to Lincoln (Midland) were opened in succession in 1848. Sheffield to Woodhouse and Beighton (Midland) followed on 12th February 1849, then Barton to New Holland, Brigg to Gainsborough, and finally Gainsborough to Woodhouse on 17th July of the same year, thereby bringing Manchester and Sheffield into direct rail communication with Worksop, Retford, Gainsborough, New Holland and Grimsby. At the Manchester end of the line the Manchester, South Junction & Altrincham was completed in 1849, the section from Oxford Road to Altrincham being opened on 20th July, that from London Road to Ordsall Lane on 1st August, and the remainder from Altrincham to Bowdon on 20th September. In the following year, on 1st July 1850, an important feeder to the Manchester-Sheffield line was brought into use. This was the Lancashire & Yorkshire branch from Huddersfield to Penistone, over which M.S. & L. trains commenced to run from the outset. A little over five weeks later, on 7th August, the M.S. & L. branch from Clarborough Junction on the line to Gainsborough to Sykes Junction on the Great Northern Railway, was opened for traffic, thus giving Sheffield a direct route to Lincoln. The new Sheffield station, destined to be named Victoria, was ready for opening in the late summer of 1851. Built of hammer-dressed Greenmoor stone, on arches 40 feet above the level of the Wicker, it possessed a frontage of masonry of 400 feet. "Its elevation gives it a commanding aspect" declared the Sheffield & Rotherham Independent two days before the station was opened, "and though its front is destitute of ornament, being very simple in its architectural character, it appears to us infinitely more appropriate for a place of business, belonging to proprietors who have yet to make a large concern pay, than the more pretentious and ornate stations in which some companies have indulged themselves." The new station consisted of a centre and two wings, a covered verandah with a closed roof supported by iron brackets extending the whole length of the centre building. The entrance or waiting hall measured 50 feet by 30 feet, with a height of 25 feet. The booking office had three windows, the centre and right-hand ones for M.S. & L. passengers and the other for Great Northern passengers. The eastern wing of the building contained the refreshment and waiting rooms, conveniences and parcels office, whilst in the western wing were accommodated the telegraph, Stationmaster's and Engineer's offices, and rooms for guards, porters and lamps. Within the station itself was provided a platform 1,000 feet in length, with a width of 40 feet, embodying bays at each end, and protected from the elements by a glazed iron framed roof, this having a length of 400 feet and width of 83 feet. Four lines passed through the station, two of them being used as empty carriage roads. Sheffield (Victoria) station was planned by the M.S. & L. Engineer-in-Chief, John Fowler, the architects being Messrs. Weightman, Hadfield & Goldie, and was opened without formality but with much in the way of decorative flags and banners on 15th Septemmber 1851. There have ben many alterations to Victoria since it was first constructed. Important widenings were carried out in 1899 and 1900, and three platforms  Nos. 1, 5 and 2  were added, the last in 1906. The adjoining Royal Victoria Station Hotel was opened on 23rd September 1862. In 1857. as a result of arrangements made between the M.S. & L. and Great Northern, trains began to run to and from Manchester (London Road) and London (Kings Cross) in 5 hours 20 minutes, the same time as to and from London (Euston Square) by the hitherto sacrosanct route of the L.N.W.R. In a moment war to the knife had blazed up between the rival companies. Both sides accelerated the timings of their trains, but with a route 15 miles longer and very much harder to work than that of the North Western, the allied M.S. & L. and G.N. could not perform the journey in less than 20 minutes more than their rival. Nevertheless, their trains were so consistently punctual that they often reached Manchester ahead of those of the North Western. It was at London Road station, which was shared by the L.N.W.R. and M.S. & L., that the liveliest scenes in the fray took place before peace was restored. Said Mr. Denison, Q.C., "The North Western authorities began to take people into custody for coming by the Sheffield trains into the Manchester station; they frightened an old lady out of her wits, and distracted several feeble people; but at last they got hold of a lawyer who showed them they had caught a tartar; and so after that no more passengers were apprehended. We" (i.e. the M.S. & L., as whose counsel Mr. Denison was speaking) "had painted up our names over our shop, but they, being in possession, which is nine points of the law, swept them out with their brush. They kept a truck standing in front of the platform, and left timber trains in front of our express trains. They turned our clerks out of the booking office  indeed they nailed up the part which the Sheffield Company had been accustomed to use, and when one of the clerks, acting under instructions, made his way in through the window, they ejected him by the same way  'not I hope' wrote their solicitor, 'with unnecessary violence'." In the same year that the fight for the ManchesterLondon traffic broke out, the long-awaited line from Penistone to Barnsley was opened. Penistone station, which was rebuilt in 1874, was to become a silent witness of two of the worst accidents that ever occurred on the line between Manchester and Sheffield. In the first, on 16th July 1884, the crank axle of a locomotive hauling a passenger train broke when rounding the Bullhouse curve, and in the resultant derailment 24 persons were killed or died from injuries sustained. In the second, which occurred on New Year's Day of the following year not very far from the scene of the Bullhouse disaster, a wagon on a goods train broke one of its axles and, jumping the metals, struck a passing excursion train, causing several carriages to be wrecked and the death of 4 passengers, 47 others being injured. The expansion of the M.S. & L., which on 1st August 1897 changed its name to Great Central, was continuous since the memorable decision taken by the Directors of the S.A. & M. in 1845, and culminated in the opening of the extension from Annesley to London in 1899, when the Manchester-Sheffield line became an integral part of the last trunk railway to enter the capital. Never rich, but always ambitious and enterprising, hemmed in on all sides by more powerful neighbours, the Great Central came to rank as one of the great railways of the Kingdom. And when, on 1st January 1923, it became a constituent company of the London & North Eastern, who adopted its proud motto "Forward", it possessed a system, including joint lines, which extended from Manchester to Liverpool, Wrexham, and Southport in the west, Sheffield, Lincoln and Grimsby in the east, and Nottingham, Leicester and London in the south. From the 44 miles stem of the S.A. & M. had grown a railway of 852½ miles, but the full story of its development, only very briefly described here, must be left for another occasion. Fascinating though the history of the first railway between Manchester and Sheffield may have been, the future of the line promises to hold much of interest. In 1936 the Directors of the L.N.E.R. approved a scheme for electrifying the whole of the railway from Manchester (London Road) to Sheffield (Woodhouse), together with the branches for Manchester (Central) via Fallowfield, and to Ashton Park Parade, Glossop, and Wath, a total of 74.6 route miles. The distinguishing feature of this scheme is that all classes of traffic will be electrically hauled and it will afford the first British example of a completely electrified railway service. 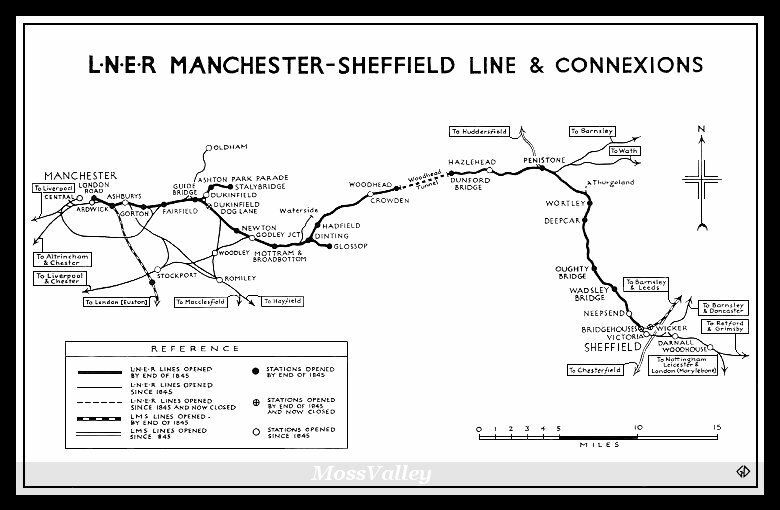 The electrification of the Manchester-Sheffield line, one of the strongest incentives to which was the likelihood of securing a 25 per cent increase in the number of trains operated through the Woodhead tunnel, was well in hand before the outbreak of war in 1939. Overhead equipment for carrying the 1,500 volt d.c. transmission wires had been erected for some miles, work had been started on the new locomotive running shed at Darnall, the first in the country to deal with both steam and electric locomotives, and orders had been placed for most of the necessary rolling stock, namely 70 mixed traffic electric locomotives and 4 six-coach multiple unit electric trains, the latter being intended for the Manchester-Glossop suburban service. The war called a halt and only one of the locomotives, upon which work was well advanced, was completed. Numbered 6701, she ultimately underwent tests on the Manchester, South Junction & Altrincham electric line with the haulage of both passenger and freight trains, from which she emerged with flying colours. The time is not far distant now when work upon this important project will be resumed, and within a few years the rugged Pennine hills, which presented so formidable a barrier to the builders of the line, will no longer echo to the full-throated exhaust of the steam locomotive. Chris Tolley's pages about the Great Central and its role in migration from Europe to North America: the GCR carried passengers to ports on the British east and west coasts. The link goes to the first of two pages. History of locomotive builders Beyer Peacock (Richard Peacock was loco superintendent for the SA&M Railway).